Recently, I got to discover an innovative and incredibly creative brand of eyewear. Warby Parker was founded with one main objective in mind: "to create boutique-quality, classically crafted eyewear at a revolutionary price point". Nowadays, owning a high-quality pair of glasses has become a luxury, and considering how common eyesight problems are and how essential eye protection is, the eyewear market should be more affordable and accessible. This is where Warby Parker comes in... Their collection of meticulously-crafted pieces creates a combination of vintage aesthetic, high quality, and affordability. As if this didn't sound good enough, they have a non-profit purpose. For every pair of glasses sold, they'll donate a pair to someone in need. Brilliant! Today, they have launched their fall collection 2013 with five new frames of eyeglasses and sunglasses midcentury-styled, with a variety of autumn-hued acetate and stainless steel. Starting at $95, Warby Parker's newest collection is all fancy, classic and practical. The perfect fall accessory, if you ask me. To get a better idea of the brand, watch their commercial here. 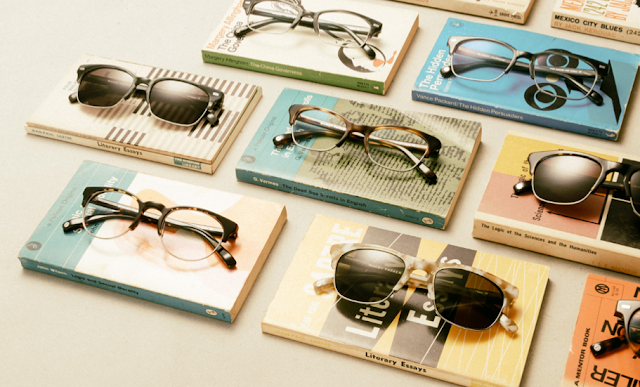 Take a look at Warby Parker's Fall Collection 2013 here. For their eyeglasses, click here, and for their sunglasses, click here. Source and images from Warby Parker.